Murkwater Goblin has +2/+0 on your turn. Murkwater Goblin is a common Agility creature card. It is part of the Core Set. This card's ability applies the Opportunist card effect. 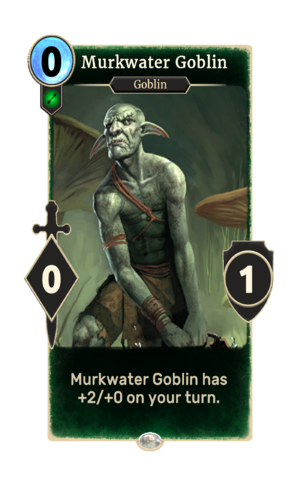 The card is named for the Murkwater Tribe of Goblins, who appeared in ESO's dungeon Fungal Grotto I — which the card's art also depicts.